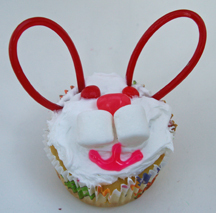 Here’s another take on Easter bunny cupcakes. These have cute licorice ears. What You Need: 1 cupcake; white icing; 2 mini marshmallows; red jellybean; 2 red mini M&Ms; pink gel writing icing; thin, stiff red licorice strands. How to Make It: Frost cupcake white. Add mini M&M eyes, red jellybean nose and mini marshmallow muzzle as shown. Using pink writing gel to add mouth. For ears, place end of one licorice strand into cupcake, loop around, and place other end into cupcake. Repeat for second ear. This entry was posted on Wednesday, March 12th, 2008 at 5:15 pm	and is filed under Easter cupcakes. You can follow any responses to this entry through the RSS 2.0 feed. Responses are currently closed, but you can trackback from your own site.